Sunday May 15th saw the Stephen Sondheim Society Student Performer of the Year Awards 2016 take place at London's Novello Theatre. Catherine Francoise was at the event for www.jonathanbaz.com and reports. 10 years on from the start of this innovative showcase awards competition, it has evolved into a major influence, showcasing some of the best final year student performers from the UK’s training academies, also discovering new writers of songs and indeed complete shows. Stiles & Drewe’s writing partnership and career were majorly boosted when they won the Vivian Ellis prize in 1986 and their initiative in setting up the MTI Mentorship Award is to provide something similar for new writers in the 21st Century. The platform the competition provides for young performers at the start of their careers is invaluable. Previous winners with now developing and established careers sang Sondheim’s Old Friends from Merrily We Roll Along: Erin Doherty (2015) Corrine Priest (2014) Kris Olsen (2012) Alex Young (2010) Michael Peavoy (2009) and Natasha Cottrail performed Dougal Irvine’s 2012 Stiles & Drewe prize winning song Do You Want A Baby Baby? from the current production of The Busker’s Opera now playing at Park Theatre 4 years later. We were also reminded that some non-winners have gone on to great things including Cynthio Erivo, now nominated for a Tony for her tremendous performance in the Broadway production of The Colour Purple (originated at the Menier Chocolate Factory). Each singer was accompanied and supported by MD Mark Warman. The 2016 Student Performer of the Year and £1000 was deservedly awarded to Guildford School of Acting final-year student Courtney Bowman. The fact that Courtney played corrupt mayoress Cora Hoover in GSA’s production of Sondheim’s Anyone Can Whistle in 2015 was clearly evident in her barnstorming performance of Me and My Town. Her second song The Driving Lesson was a hilarious tour de force by this year’s Best New Song award winner Tim Connor (although Tim actually won his award for a different song in the competition). Courtney’s characterful and tremendously well sung performances lit up the stage. Rivets by David Perkins, Dominic & Joe Male, a witty, wordy quirky song indeed which Dafydd Gape of Royal Welsh College of Music and Drama obviously enjoyed performing very much. More To Life by James Burn, as mentioned sung wonderfully by runner-up Eleanor Jackson. Little Wooden Horse by Chris Bush and MattWinkworth sung movingly by Royal Conservatoire of Scotland student Tabitha Tingey. 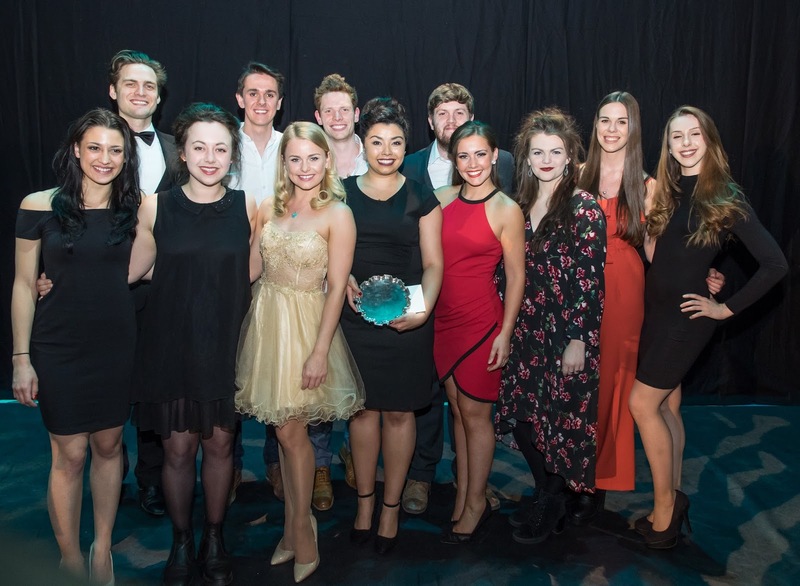 Alongside the celebration of Sondheim’s work, the competition was also set up to showcase and promote new writing and this year Stiles & Drewe divided this award into two parts. Tim Connor won his £1,000 Best New Song award for Back to School. London Academy of Music and Dramatic Art Ashley Reyes who sang Back to School received a £100 bonus prize from The Newsome Family. Perhaps the most exciting and intriguing winner was that of the tremendously valuable inaugural MTI Mentorship award, which will offer support, feedback, workshops, writing & progress evaluations and mentoring for full year, culminating in a professional industry showcase (who wouldn’t be ecstatic to win this award!). Composer/lyricist Darren Clark and book writer Rhys Jennings for Wicker Husband, both looked excited, overwhelmed and truly grateful to receive this award. We heard a tantalising taste of this new musical when Mountview Academy of Theatre Arts student Lauren Drew sang a very beautiful evocative song, My Wicker Man. George Stiles described the show as ‘a sort of Folk Tale’ and ‘other worldly with all sorts of possibilities’ ~ I personally can’t wait to hear more! Demonstrating a wide range and variety of songs and performance skills we are certain to see some, if not all these finalist performers and writers in productions in the future. Sondheim is notoriously challenging to sing and whilst everyone acquitted themselves well, a few young singers could have possibly chosen songs which suited their ages and technical abilities as they are now rather than as they will be in a few years or even 10 years’ time. Tempting as it is to sing the big Sondheim ‘torch songs’ there are so many wonderful songs to choose from, it might have served them better to choose lesser known songs that may have showcased them even more strongly than the iconic songs did. The tremendous calibre of the judges should also be noted. There is a separate panel of judges for each element of the competition enabling them to concentrate on their specific area. Judging the STUDENT PERFORMER OF THE YEAR Edward Seckerson as chair was this year joined by Jason Carr, Sophie-Louise Dann, Anne Reid and director Thea Sharrock. Judging BEST NEW SONG were Don Black, Paul Hart, Lotte Wakeham, George Siles & Anthony Drewe. Finalist judges for the MTI STILES & DREWE MEMBERSHIP AWARD were Vicky Graham, Paul Hart, Luke Sheppard, George Stiles & Anthony Drewe. A wonderful afternoon of young music makers was also further enhanced by truly wonderful performances from Julian Ovenden and Sophie-Louise Dann who finished the first half by singing the powerful soul-searing duet Move On from Sunday in the Park with George. Sophie-Louise Dann also sang a touching new song by Stiles who accompanied her, Six and Half Inches from your Heart from a new musical called Becoming Nancy. Whilst the judges were deliberating Julian Ovenden sang two songs from Sondheim’s earlier work: Love I Hear from A Funny Thing Happened On The Way To The Forum (1962) finishing with a tremendous Being Alive from Company (1970). There are so many people involved with the SSSSPOTY awards and everyone has to be named and thanked which unavoidably means fairly long lists of names and credits which could make it feel like an end of term school event. As well as singing, Ovenden was a warm, witty and very charming compère and host. Ovenden’s repartee, genuine love of Sondheim & Music Theatre and respect for all performers, kept things flowing whilst also ensuring we got all the necessary information. Congratulations to all writers and finalists. Musical Theatre is fortunate indeed to have Stiles & Drewe, Julia McKenzie and Edward Seckerson providing this tremendous opportunity and being so passionately committed to young performers and new writing. And we are in for a treat with The Wicker Husband methinks!